Nick Travis (Lamas) is an FBI “Mind Hunter” on the trail of a serial killer named Dacy (Busey) (the changing of a “G” to a “D” in the name was pretty inspired). Naturally, Travis’ ways are unorthodox, so the bureau teams him up with a new recruit, the pretty Kelly McCord (Cloke), a gung-ho agent who wants Dacy and his gang as much as anyone. Second-guessing them every step of the way is Taggart (Scheider), an FBI higher-up. But Travis has just too much integrity to bend to his ways. While the deranged Dacy is putting his team of psychopathic yokels into high gear, Travis and McCord must race against time to prevent any new victims before becoming victims themselves. Not just of the killers, but of federal bureaucracy and corruption. Will their relationship survive against all odds? In terms of technical qualities, this DTV effort stands above some of its contemporaries. It has a fairly glossy, high-quality look and feel that is just a hair away from being theater-ready. The cinematography is quite good, and the picturesque locales in Utah help that along nicely. The score is also big and booming. Lamas puts in a personable performance as the FBI Agent On The Edge (not to be confused with his roles as a CIA Agent On The Edge in the CIA films). He has as many cool one-liners as he does snappy ties in his wardrobe. Cloke, as his partner, puts in a good amount of effort and you’ve got to love those bedroom eyes. Roy Scheider could presumably do better (as he clearly demonstrated by being in Executive Target, 1997) in his career, but at least you get to see a fight scene between him and Lorenzo Lamas. You truly haven’t lived until you’ve witnessed Roy Scheider-Fu. As far as Gary Busey...if he’s trying to live down his reputation as a raving psycho, movies such as The Rage aren’t helping him too much. 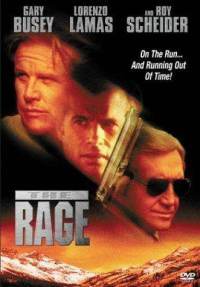 We think the filmmakers renamed the film from Word of Honor to The Rage in honor of Busey and his performance. There are plenty of classic Buseyisms on display as he rants and raves with wild abandon. Also David Carradine is literally wasted in a nothing role that’s almost as senseless as Klaus Kinski’s in The Soldier (1982). The Rage might be a good movie to see if you want to break someone into the world of DTV movies. Its “not quite ready for the movie theater” feel should help gradually wean a newbie in. Also check a review by our buddy, DTVC! I'd love to see this for the Busey. Yeah, interesting to read this as Sidney J Furie directed one of my favourite all time films - The Ipcress File. He's had a nomadic career that's for sure and he's still making movies at the age 80! God bless Furie for continuing to make movies and for dealing with the insanity of the Busey! Busey being Busey (which is always great), or a Roy Schieder fight scene. You can't go wrong watching this for both those reasons. The Roy Scheider Fu scene was unexpected and very funny.